In the second round of the Astrakhan stage of the FIDE Grand Prix the Russian grandmaster Evgeny Alekseev lost his game on time for the first time in his career. According to the regulations, each player receives 2 hours for 40 moves, then 1 hour for the next 20 moves, and then 15 minutes plus 30 second per move until the end of the game. Peter Leko, Alekseev’s opponent in this game, played very peacefully in a well-known line of the Benoni Defense. The game transposed to an ending with a slight advantage to White. Alekseev was forced to defend, and he started to consume too much time, which eventually led to a time loss on the 40th move in an approximately even position. Svidler played White against Ponomariov and ended the game by a big blunder on the 24th move – after Ponomariov’s accurate reply the Russian had to resign. Before committing the blunder Svidler failed to obtain any opening advantage in the Berlin Variation of the Ruy Lopez, and Black’s position was even slightly better, although White obviously could hold a draw rather easily. Pavel Eljanov outplayed Vladimir Akopian in the endgame. Akopian, playing Black, managed to solve his opening problems in the Slav Defense, and then simplified the game by trading queens and several other pieces. However, before the first time control, Eljanov outsmarted his opponent and won a pawn on the 42nd move. The knight ending that followed was winning for White, and Eljanov’s technique did not let him down. Wang Yue voluntarily accepted an inferior ending against Vassily Ivanchuk. The Ukrainian played well for most of the game and had a serious advantage, but then missed Black’s counterattack in the center and decided to force a draw by a spectacular rook sacrifice. Dmitry Jakovenko played White against the leader, Vugar Gashimov. In the Benoni Defense the Russian selected a very aggressive plan, but was probably unsatisfied about his position by the move 23, and decided to accept the move repetition offered by his opponent. 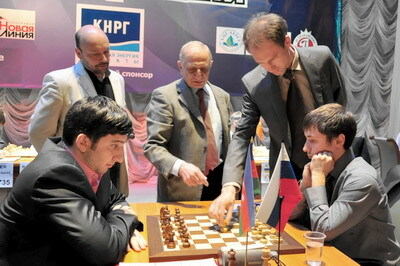 Alexander Khozov, the Minister of Sports of the Astrakhan Region, made the symbolic first move in this game. Teimour Radjabov had a certain advantage against Ernesto Inarkiev in the endgame that quickly arose out of the Scotch Opening. However, the Azeri grandmaster selected a couple of safe but second-best moves, and Inarkiev equalized the game. A draw was agreed on the 28th move. Boris Gelfand defeated Shakhriyar Mamedyarov, despite not gaining any edge in the opening. However, in the middlegame Mamedyarov showed excessive ambition, and Gelfand sacrificed a pawn and created a strong attack. This turn of the events caught Mamedyarov unprepared, and he did not defend in the best possible way. Gelfand managed to trap and win the Black’s rook, which forced Mamedyarov to resign. Neither player has a perfect score after two rounds, and five grandmasters have 1,5 pts out of 2. The third round of the Astrakhan Grand Prix takes place on Wednesday, May 12th.